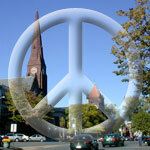 Everyone is invited to our weekly peace vigil, Saturdays, 11:00 a.m. - 12:00 p.m., in front of the County Courthouse (on Main Street between Gothic and King), rain or shine (or snow, or deep-freeze). We stand for an hour holding signs and passing out flyers. Most weeks we print a new flyer. One side contains notices for ongoing and coming events, and the other a timely news or opinion article (sometimes by one of our own). We have signs for you to hold, or you can bring your own sign relating to peace and justice. Creative props other than signs are always encouraged! From May through October, the vigil coincides with the Farmers' Market, which is one street over on Gothic. 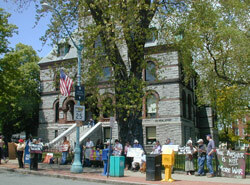 The Northampton Vigil was begun at the time of the December, 1998 airstrikes ("Operation Desert Fox") to protest the ongoing sanctions against Iraq. The group behind it was first "The Northampton Committee to End the Sanctions on Iraq." The name changed several times: it briefly became "...to Prevent War against Iraq," then "...to Stop the War in Iraq," and now "...to Stop the Wars."